Larry Rivers speaking at a World Matters event hosted by the Alaska World Affairs Council. Photo: Robin Spaulding. We’re featuring something a little different on the program this week. 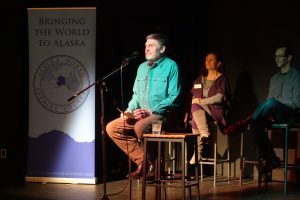 We’ll hear from a World Matters storytelling event titled “Foreign Faux Pas – Stories of Navigating Cultural Differences.” Formatted in the style of Arctic Entries, we’ll hear some “Oh no” moments from fellow Alaskans that have traveled abroad. RECORDED: Friday, March 13th, 2017 at 49th Brewing Company.